Simon & Schuster/Paula Wiseman Books, 9781416985235, 32pp. Little Cloud likes her own place in the sky, away from the other clouds. There, the sky is all hers. She is free to make her own way and go where she wishes. Can Lady Wind show Little Cloud the power of being with others? Will Little Cloud agree there is strength in unity and change her ways? A fresh take on a classic story, Little Cloud and Lady Wind will teach kids how to work together to achieve their goals. Toni Morrison is a Nobel Prize–winning American author, editor, and professor. Her contributions to the modern canon are numerous. Some of her acclaimed titles include: The Bluest Eye, Song of Solomon, and Beloved, which won the Pulitzer Prize for Fiction in 1988. She won the Nobel Prize for Literature 1993. Slade Morrison was born in Ohio and educated in New York City. He studied art at SUNY Purchase and collaborated with his mother, Toni Morrison, on five books for children. Sean Qualls has created art for magazines, newspapers, advertisements and children's books. His work is a mixed media combination of painting, drawing, and collage. Sean is the illustrator of Before John was a Jazz Giant, which received the Coretta Scott King Honor award; The Baby on the Way (FSG), a New York Times Notable Book, Powerful Words (Scholastic); Poet Slave of Cuba (HENRY HOLT), a BCCB Blue Ribbon Book; How We Are Smart (Lee & Low) and Dizzy (Scholastic) an ALA Notable, Kirkus Best Book, BCCB Blue Ribbon Book, School Library Journal Best Book of the Year, Booklist Editors' Choice, Horn Book Magazine Fanfare Book, and a Child Magazine Best Book. 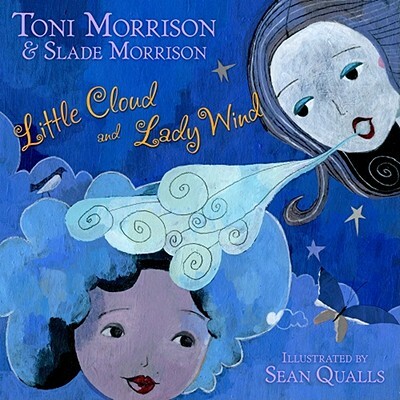 His first book with Simon and Schuster is Little Cloud and Lady Wind (Spring 2010) by Toni and Slade Morrison. He lives with his wife and son in Brooklyn, New York.